Here comes the second season of the web series called Laakhon Mein Ek, which is created by Biswa Kalyan Rath, while it is produced under the banner called OML Production. The web series has the director as Abhishek Sengupta, while we have Shweta Tripathi, Sandeep Mehta and Milind Joshi in the lead role and these actors play the characters called Dr. Shreya Pathare, Dr. Gopal Patwardhan(CMO) and the Health Minister in the lead roles. It has started to air from 12th April 2019 and number of episodes are yet to be released, while the web series will be aired at the platform called Amazon Prime Video. 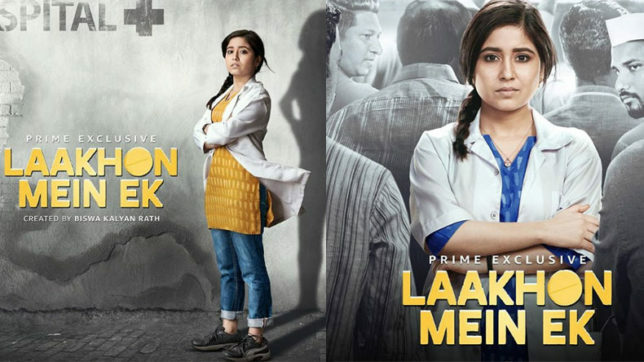 The plot revolves around a young doctor played by Shweta Tripathi; she is honest and hardworking the local politics inside the hospital lead her to a small village called Sitlapur village to carry out a cataract camp. But the people in the villager are not keen on getting the services of Government healthcare. The local politicians and others have their racket of smuggling the medicines given by the government and she tries to expose and thus faces the opposition from the culprits. So, what happens next would be interesting to explore. The episodes are available on the Amazon Prime Video, have a look at them and let us know about the same. The teaser released earlier on 3rd of April, and it was a big hit in the social media. People really liked it and shared their views about it. It was launched in the presence of B Town actress Taapsee Pannu and she was the one who introduced the web series to the media. However, she was not prepared to answer the tough questions asked by the reporters out there.